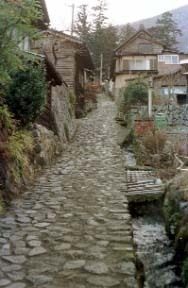 A hot spring resort stands in a row long and slender along a lower river.A wooden Ryokan remains in the deepest part and it gives the countrified hot spring sentiment in it.It is told that Shingen Takeda cured the wound in the battle of Kawa-Nakajima, especially a cut and the sequela of fracture have an effect, and there are many visitors to a hot-spring resort.Although it can escape from a summer to Shizuoka by the Yunooku path-through-a-wood pass over, the nature of it which has little traffic is left behind. [ rich ]a gun -- the wild boar driven off to inside had also been to the Ryokan town -- an enough. 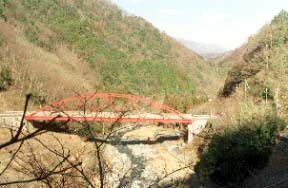 It is an upper stream a little than a lower river and a hot spring resort.Landlocked salmon fishing is prosperous.An about 2 more km upper stream is Yunooku.